A mysterious masquerade theme prom is incomplete without party favors featuring masks to truly complete the effect. 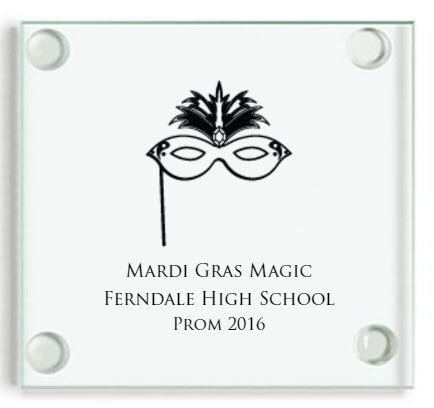 Glass coaster favors with a mask print, and further customized with the event details are excellent choices for all the guests. 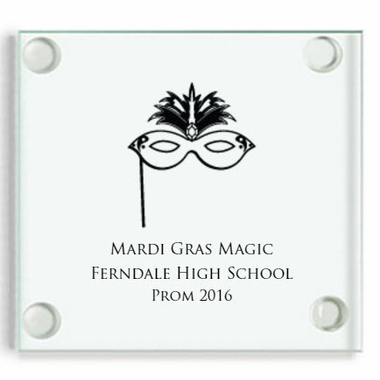 The memories of the fun and frolic they had at prom will forever remain in their lives through this treasured keepsake. Each square glass coaster measures 3.5 inches and has rubber feet so it won't slip. Your design is carefully silkscreened directly on to the glass. Coasters are not in individual boxes; they come bulk packed. You can order white gift boxes for $.50 each. They will come flat and you can assemble to insert your coaster favor and finish the presentation with a lovely white peel and stick bow.